The Pizza Company, Thailand’s market leader in the dine-in, delivery and take-away food business and one of Asia’s best known pizza brands, has announced to be the co-sponsor of the Optimist World Championship 2017 as part of the company’s vision for sustainability for people development and supporting youth and local community. The event will be organized from 11-21 July, 2017 at the Royal Varuna Yacht Club (RVYC) in Pattaya, Thailand. Thomas Whitcraft, President of the Optimist World Championship 2017 Thailand and Mr. John Heinecke, Chief Operating Officer of The Minor Food Group PCL, together for the signing ceremony marking The Pizza Company’s sponsorship of the Optimist World Championship 2017. The international race is organized by the Royal Varuna Yacht Club (RVYC), the Yacht Racing Association of Thailand (YRAT) in conjunction with the International Optimist Dinghy Association (IODA) with support from the Sports Authority of Thailand (SAT). IODA member countries including Thailand will send their most talented Optimist sailors to race as national representatives on this world stage. 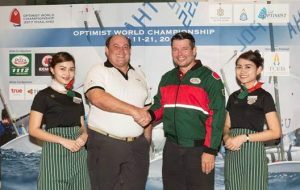 Thomas Whitcraft, President of the Optimist World Championship 2017, said, “We would like to thank The Pizza Company for their great support, and we look forward to working jointly to further boost the growth of the sailing sport in Thailand as well as to promote Thailand as a world class sailing destination for both yachts and dinghies”. The Optimist Dinghy has proven to be the ideal boat for introducing young children to the sport of sailing. The objective of the class is to provide an affordable racing boat for young people. More than 85% of all sailors who participated in the Olympics sailed in Optimist dinghies when they were young.